In the heart of the downtown Washington DC, a brand new museum is attracting anyone curious to learn about the exciting and informative history of journalism in America. The Newseum, with 250,000 square feet of exhibits and galleries showcasing news media from our past, presents visitors with a picture of news-making over the past 500 years. With state of the art exhibits and interactive media, guests will have an enjoyable learning experience. Dedicated to ensuring greater understanding between the public and the press, the institution places great emphasis on raising public awareness and support for the press and press rights. Symbolic of this goal is the 74 foot tall engraving of the text of the First Amendment on the outside face of the building. The museum also makes use of fiber-optic cables, numerous theaters and broadcast studios, and high resolution panels. Located on the corner of Pennsylvania Ave and Sixth Street, in the northwest corner of the nation's capitol, the Newseum stands close to both the Smithsonian Institution and the National Mall, a clear indication of its significance and importance to the public at large. Among the many exhibits currently on display at the Newseum are displays dedicated to Elvis Presley, the FBI, former NBC anchor Tim Russert, and Sports Illustrated photography. With fourteen major galleries over seven different floors, there's something for every visitor, both young and old. The building also includes numerous amenities, with a large conference center, a food court, and a fine-dining restaurant. There are also various upcoming events including an appearance by Grammy award winner Mary Chapin Carpenter, a documentary premier of "Chaplains Under Fire", and a lecture with WUSA9 reporter Bruce Johnson. The museum is open from 9 am to 5 pm daily, excepting Thanksgiving, Christmas, and New Years Day. 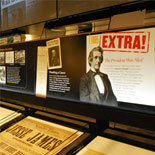 Newseum guided tours are available and include highlights of the museum's offerings to the public. These highlights include exhibits concerning the Unabomber, spy Robert Hanssen, the Berlin Wall, the Civil War, and the sinking of the Titanic. Another point of interest in the museum tour is the Newseum store, where you can take a few minutes to browse some of the items for sale there to commemorate your trip. Parking space for vehicles and buses are not available in the immediate area, so costs of parking must be taken into account. Wheelchair access is also available, with wheelchairs available on a first-come basis. Given the variety of attractions and the exciting services and amenities offered to guests, the Newseum should be on the itinerary of anyone touring the sites of downtown Washington D.C. The unique blend of high tech exhibits, keynote events, and entertaining activities offered at the Newseum is sure to cater to any would-be guest. Don't miss the chance to see this extraordinary museum of news - a must see for everyone.